We were at the office going over the lineup for the Valentine’s Day show for Dave Kelly Live. It’s coming up in under a month. It’s all about love, and we were talking about relationships and what matters. Now I am not the relationship expert by any stretch. I’ve made my share of messes. But one thing I’ve learned is being funny can get you pretty far. Like Blythe and the van. When I started getting to know Blythe, I learned early on that she loves cars. Like, she LOVES cars. Some of her favorite childhood memories involve watching Formula 1 on TV with her Dad. I have no idea about cars. I’m still not sure what Formula 1 is. One of her favorite events of the year is the weekend they have the Barrett Jackson Somethingorother Car Auction Thing on TV. They push a car up a ramp, people yell, someone wipes it with a cloth, someone opens the hood and talks about racket pinion steam turbines, people yell some more, and they push it down the ramp. Riveting. She doesn’t leave the couch. She can talk about cars all day. One time we were out and I noticed a fast-looking red car driving beside us. “Isn’t that a Camaro?” I asked, trying to impress her. Apparently, I should know what a Ferrari looks like. She knows what year our cars were made without having to look at the registration. I can usually get the color right. So, back to the van. When we started talking about having kids, Blythe didn’t care about colors for the baby room, she wasn’t interested in reading parenting books, she didn’t look up baby names. There was only one thing that mattered to Blythe. “Okay,” I said. I was just glad I knew what she was talking about. And then John showed up. And then Tess came. Our amazing family. And one day, she cracked. She was trying to fit the kids, the baby seats, the groceries and about 18 boxes of baby stuff from IKEA into our little car, and she finally cracked. “I think we need something bigger,” she said. And so we did it. We bought a minivan. I couldn’t believe it. She loved all the room, the sliding doors, and she loved the 35 cup holders it came with. 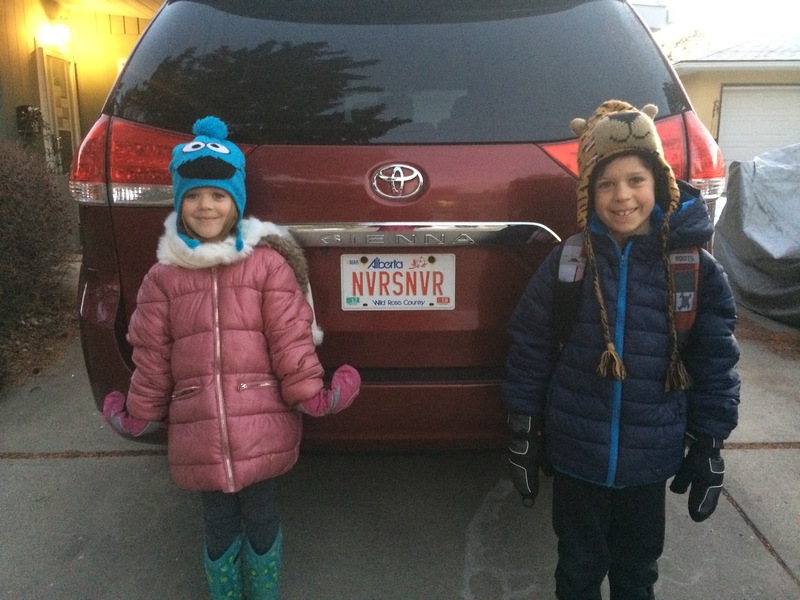 Now, I could have picked on her just a bit for caving – for becoming the Minivan Mom she swore she’d never be. I could have judged her just a little. But that’s where funny came in. A few months after getting the van, she bought a new license plate. How can you not love someone who does that?